About thirty years ago (blimey!) 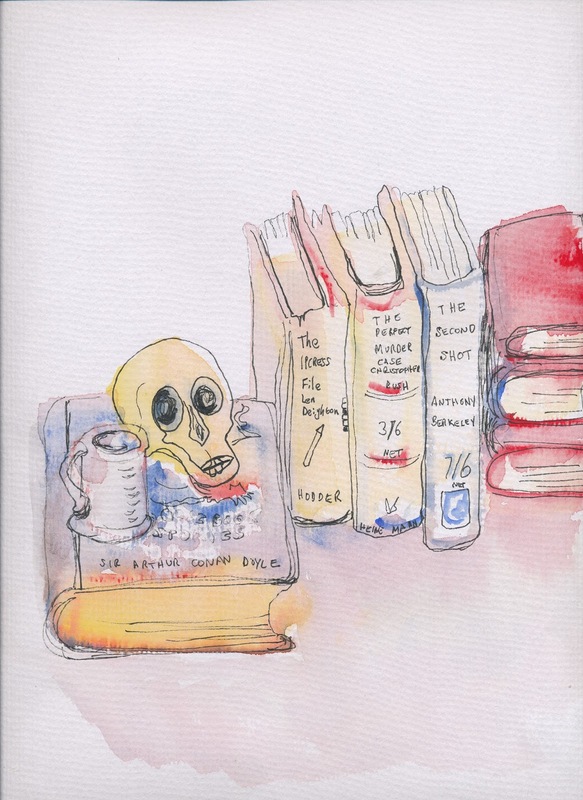 the Folio Society commissioned me to write an article for its magazine "Folio" about Raymond Chandler's literary style. This accompanied a lovely set of Chandler's books, which still has pride of place on top of my bookshelves, close to where I'm typing this blog post. The set sold well, and there was a second edition a few years later. Over the years since then, I've added a few more Folio Society editions of crime novels to my collection. They are always highly attractive. And now the Folio Society have reissued The Floating Admiral by the Detection Club, in a beautiful new edition with lovely illustrations by Mark Thomas. I've picked out one of them to head this blog post. All in all, this edition strikes me as highly collectible. The book also boasts a brand new intro from Simon Brett, which is characteristically witty and enjoyable. The enduring appeal of this "round robin" detective novel is clear. And members of the Detection Club are very much hoping that our latest collaborative novel, The Sinking Admiral - not a sequel to the original, but in some ways a homage to it - will also find an appreciative audience. It will be published in June. Can't wait! Maigret Sets a Trap, starring Rowan Atkinson as the legendary French cop, aired on ITV this evening. Many eyebrows were raised by the casting of Atkinson as Georges Simenon's Chief Inspector Maigret, but John Simenon expressed his delight with the performance when we discussed Golden Age fiction on stage at the Essex Book Festival a fortnight ago, and having seen the show, I can see why. Atkinson, I felt, did a pretty good job. There's more to him as an actor than Blackadder and Mr Bean. I never saw the famous Maigret series starring Rupert Davies, for which I was too young, but I did enjoy one of John's anecdotes about it - apparently his father taught Rupert Davies how to use a pipe. Wisely, the pipe was retained for the new show: Maigret without his pipe would be rather like Morse without opera or Marple without her knitting - somehow incomplete. 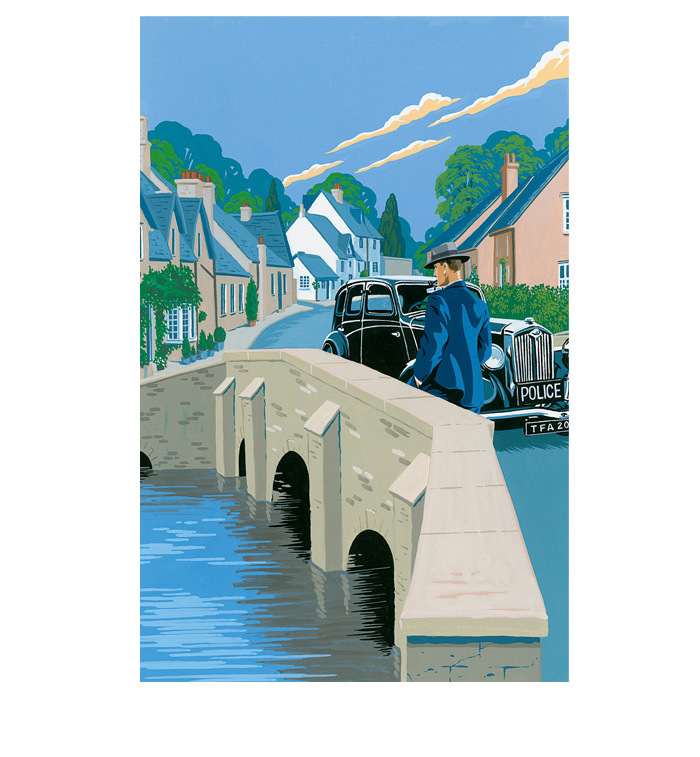 Maigret doesn't drive, and Atkinson - a car obsessive - wanted to change that, but wisely, the temptation was again resisted. I did see the series in which Michael Gambon played Maigret,and I quite liked it, but felt that it lacked excitement. Some aspects of the Maigret stories are low-key (and when I first read them as a teenager, I was slightly underwhelmed, although with hindsight I feel that this was perhaps due to the nature of the translations) but a crime story that doesn't grip and, in some way, excite doesn't have much of a future. The Maigret books are short and snappy, and I worried that a two-hour version might drag. Coincidentally, I embarked on a Simenon reading binge a little while ago, and the republication of his work by Penguin, with excellent fresh translations, has re-ignited my enthusiasm for this remarkable author. So has hearing John speak about his father, with insight and affection. I'm hoping to review a number of Simenon books in the coming months - not just Maigrets, but also some of his non-series work. In the meantime, I look forward to the next TV adaptation. The Night Manager, the sixth and final episode of which aired on BBC 1 this evening, is one of the finest British television series I've seen in a long while. In recent years I can only think of Broadchurch (the first series, definitely not the second) and Happy Valley which were similarly compelling. 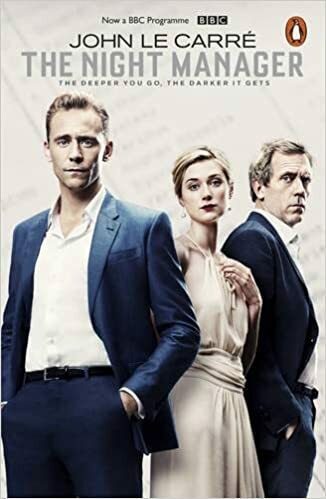 In contrast to those two series, The Night Manager was based on a novel,. It was written by the legendary John Le Carre, and I haven't read it, although evidently the process of updating the story to the present and for the screen has resulted in many changes. Why has the story hooked me, and millions of others? Well, first of all, it offers a gripping blend of plot and character. Jonathan Pine, the enigmatic hotel manager with a military past, becomes involved with a beautiful woman who falls foul of a fabulously wealthy villain called Roper. When she is murdered, Pine is jolted out of his apparently comfortable lifestyle,and is persuaded by a British secret agent, played by Olivia Colman, to infiltrate Roper's organisation and bring him down. Back to The Night Manager. The relationships, for example between Colman and her colleagues,and between Hiddleston and Roper's lover, are done in enough depth to make us care about the characters,and about what happens to them. I was glad that the final episode matched the quality of the preceding five. One brief but memorable scene did owe something to The Long Good Friday, but without in any way compromising the originality of the storyline. A script so good deserved great acting, and that's exactly what was supplied by Tom Hiddleston, Tom Hollander, and Elizabeth Debicki. I wasn't quite sure at first about Hugh Laurie as Roper; was he credibly nasty enough to play the part? My misgivings proved needless Laurie presented a character with great superficial charm, a caring father who has people killed for profit; he was at his best in the final episode, when his true nature came to the surface. Hollander was brilliantly creepy as Corky, and Hiddleston has really made a name for himself with this show. I wasn't sure before I started watching The Night Manager whether I'd love it. But I did,- I really did. My Forgotten Book for today was And Being Dead, the novel with which Margaret Erskine introduced herself to the reading public in 1938. My copy, inscribed by Erskine, contains a copy of the original review in The Observer by Torquemada, who admired it. Given that Torquemada was arguably the leading crime critic of the day, Erskine must have felt greatly encouraged, although oddly her next novel did not appear for another eight years, presumably for reasons connected with the war. A libidinous artist called Kenneth Dean is introduced at the start of the book, and promptly dispatched. The murder is too much for the local police to handle, and they call in Scotland Yard. Inspector Septimus Finch, suave and public school educated, and his Hendon-trained sidekick, Sergeant Bratton, duly arrive to take charge. The setting, a coastal resort called Coldhithe, is pretty well evoked. Erskine was born in Canada but brought up in Devon, and it may be that her fictional setting is based on a Devonian model, but I'm not sure about that. I am sure, though, that Erskine was a decent writer. This book has, like most first novels, a number of flaws, but the writing and characterisation are rather better than that to be found in many of the books of the Golden Age. Finch is a mildly likeable character, and he became a fixture in Erskine's books. This one, by the way, has sometimes been published under alternative titles - The Limping Man and The Painted Mask. Her reputation has faded, but her career as a published crime novelist lasted for forty years, which strikes me as no mean achievement. She wasn't especially prolific, barely averaging one novel every two years, but she doesn't deserve to remain forgotten.. The Human Flies, published in the author's native Norway six years ago, was the first novel by Hans Olav Lahlum. He's a historian, chess player, - and politician: well, nobody's perfect! This book, published in the UK by Mantle, has made quite a splash, and is often described as a homage to Agatha Christie. It features a murder victim in a locked room, and is set in 1968, with plenty of references to events n the 1940s, making good use of Lahlum's historical expertise. A famous hero of the Resistance is found dead in his apartment. It seems clear that one of his fellow residents must be guilty, and before long a variety of connections emerge between the victim and his neighbours. So we have a "closed circle" of suspects, and also references n the text to Christie and - more surprisingly, but not very significantly, to that American master of the short mystery story, Stanley Ellin. We also have a detective duo in the classic mould, Kohljorn Kristiansen, a likeable detective inspector, narrates the story,but in effect he plays Dr Watson. The role of Sherlock goes to a wheelchair user called Pamela who is a brilliant sleuth and keeps giving him clues to the mystery when he's running out of ideas. This pair are very appealing, and I enjoyed the characterisation of them. Yet another pleasing nod to the classic mystery was a complex will - read with relish by a rather sadistic lawyer, if such a character can be imagined. The first hundred pages or so were totally gripping, but I must admit that my enthusiasm faded a little as the story delved deeper into war-time events, and the classic plotting elements faded into the background to some extent. Overall, I felt the book would have benefited from cutting - as is so often the case - and I did feel that Karl Dickson's translation was clunky at times.. But there's a lot to enjoy here, and I'd be glad to read more about Pamela and "K2". In Fear is a low-budget British horror film that is at times genuinely frightening. Less ambitious than The Shining, yes, but I found it at least as impressive, partly because writer and director Jeremy Lovering was wise enough to keep the film short - it's just 84 minutes long, and perhaps could have been cut even more ruthlessly - there are only three characters, and the storyline is restricted in terms of both time and place. Tom (Iain De Caestecker) has been going out with Lucy (Alice Englert) for just two weeks. He's taking her to a music festival, but springs a surprise on her - he's booked them into a hotel before they reach the festival. She agrees to accompany him, but an incident in a pub (the setting is Ireland, though the film was shot in Cornwall and Devon) in which Tom gets involved in a contretemps with some locals, is rather unsettling. I have vivid memories of a beautiful evening which I spent driving in Ireland's Wicklow Mountains with my family a good few years ago. Incompetently, I got lost - and as I drove round and round the narrow country lanes, my petrol started to run low....so I really did find it easy to empathise with Tom and Lucy's plight. I'm not suggesting this film is a masterpiece, but Englert's performance in particular is excellent, and a creepy soundtrack enhances the fear factor. Well worth watching. I've very much enjoyed reading the Detective Story Club reprints that are being so attractively republished by Harper Collins. They occupy a slightly different part of the market than the British Library Crime Classics series, covering a longer time frame and including thrillers as well as whodunits. The books are keenly priced hardbacks with dust jackets that reproduce the original cover artwork. As you can see from the above image, The Terror is nothing if not dramatic! 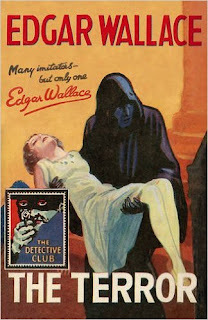 The Terror was written by Edgar Wallace and is the second book in this series to which I've provided an introduction; the first was that very intriguing Victorian novel Called Back, by Hugh Conway. This is a very different kind of story, but it's packed with twisty action; reading it,you can see that Wallace had the storytelling skills of a mega-seller. The Terror headed the list of six books which got the Detective Story Club off to a flying start, and was the only one of the half-dozen that was not a reprint. Wallace got the idea while on holiday in France in 1926, and turned it into a stage play before writing the novel. It was quickly filmed, and then remade with Alastair Sim and Bernard Lee in lead roles. This edition also includes, as a bonus, Wallace's story White Face, which was also based on a stage play. Again, it was also filmed, though the film is now considered 'lost', and again it supplies lively escapist entertainment. The titles included in this series are highly diverse, ranging from the two books I've introduced to The Ponson Case by Freeman Wills Crotts and the highly enjoyable first appearance of Colonel Anthony Gethryn, The Rasp. And quite apart from their lively contents, these books do look lovely on the shelf! The premise of Houdini & Doyle is excellent. The legendary escapologist and the man who created the world's most famous detective knew each other in real life, and someone had the bright idea of teaming them as a sleuthing duo in a television series. Even better - potentially - the first episode of the series sees the pair investigating a locked room mystery. What could possibly go wrong? The setting for the crime, a Magdalene laundry, was evocative, and the glimpses we were given of Houdini's stagecraft were well done. In fact, Michael Weston made a pretty good job of playing Houdini. Alas, the American producers of the show reportedly told Stephen Mangan not to play Doyle with a Scottish accent (something Nicola Sturgeon ought to complain about, surely) and he seems to have lost heart as a result, splitting his infinitives without a care. At no point did I find his portrayal of Doyle compelling. Nor did Tim McInnerny convince as the grumpy senior cop; a shame, as I still remember him fondly from Blackadder and he is very good in the new film based on Spooks. For gender balance, we were presented with an attractive female police constable character, who contributed little to the detective work. How many women PCs were there in 1900, anyway? I don't mind when stories veer away from strict historical accuracy, or make mistakes on matters of detail. Goodness knows, I've erred myself, more than once. But there needs to be a sense that the writer is striving to get it right, even if not with complete success. Houdini & Doyle gave me the impression that those in charge didn't care enough about the history or the characters, and as a result that splendid premise seemed to me to have been wasted. A shame. The House that Kills was the first detective novel published by Noel Vindry, a major French writer of the Golden Age who was unknown to almost all English-speaking fans until recently, simply because nobody translated his work. Now, John Pugmire of Locked Room International, has repaired the omission,and published a nice paperback edition with an intro and appendices. As John says in the intro, at one time Vindry (1896-1954) had a reputation to match those of two Belgians, Georges Simenon, and Stanislas-Andre Steeman (whom I've discussed previously on this blog). I was fascinated to learn that Boileau-Narcejac were huge fans of Vndry, speaking of his "unequalled virtuosity". Narcejac even went so far as to suggest that Vindry surpassed Ellery Queen and John Dickson Carr. I have to say that - on the evidence of Vindry's debut - this seems over the top, but Narcejac studied the genre in depth, and his opinions on it certainly command respect. So I look forward to reading Vindry's later work. Vindry trained as an examining magistrate,and put his professional know-how to work by giving the same occupation to his Great Detective, Monsieur Allou. Vindry's focus was on puzzle rather than character,and Allou is not drawn in great depth (but then, you might say the same of Hercule Poirot). His speciality is solving impossible crimes, and here he is confronted by a bunch of them. This is a clever book, if dry in style when compared to John Dickson Carr's atmospheric writing. Vindry was certainly ingenious, and Locked Room International have done a great job in making his debut available at long last. They also publish Paul Halter, a present day exponent of the impossible crime story who has attracted many admirers. Halter's work is also worth seeking out, and if you liked miraculous murders, I think you'll enjoy The House that Kills. Will you be able to solve the various puzzles before Allou? They aren't easy to crack believe me.. . When I was in Torquay last autumn, attending the Agatha Christie Festival, I popped into an art display in the Grand Hotel. Like pretty much everything happening in Torquay that particular week, it had a Christie theme, and I was instantly taken by one of the pictures, in which the artist had painted a host of Christie hardbacks on two shelves. Very striking indeed. Unfortunately but unsurprisingly, someone had already bought it. But prints were also available, and I was quick to bag one. As well as being a very occasional crime writer, with two published stories to her credit, Mrs Edwards is also an accomplished artist, and she too was impressed with the Christie print. There is something very attractive about old books in good condition, and they make appealing and rather unusual subjects for paintings. So she has set about producing a few of her own devising - an example is above - and at least there is no shortage of old books in the Edwards household to appear in her works. They make excellent presents, so if you're looking for an unusual present for the crime fan in your life, let me know, and I'll put you in touch with the artist herself. She has also started a blog, which tells you a lot more. "Continuation novels", where a writer adopts another writer's character - such as Sophie Hannah's The Monogram Murders -have long interested me. But even more fascinating, though less common,are books which are begun by one author and completed by another, and it was this fascination that led me to finish the late Bill Knox's The Lazarus Widow. Recently, a Golden Age example of this type of novel has come my way, thanks to the valiant efforts of Dean Street Press,who have reprinted the complete crime fiction of Annie Haynes, who until recently was a very obscure writer indeed..
She was in very poor health when she started writing her last book, The Crystal Beads Murder, and she died with it still unfinished. Another author took over - but here is the really interesting thing: we don't know who it was. The original introduction, by Ada Heather-Bigg (with whom Haynes lived for many years) simply describes her as one of Haynes' friends, and adds that she "also a writer of this type of popular fiction...it says much for her skill that she has independently arrived at Miss Haynes' own solution of the mystery, which was known only to myself." In an interesting new intro to the book, Curtis Evans speculates about who completed the book, listing prominent women crime writers of the time as Agatha Christie, Dorothy L. Sayers, Anthony Gilbert (Lucy Malleson), A.Fielding, Molly Thynne and Margaret Cole. I feel sure that Christie, Sayers, and Cole can be ruled out, and I don't know anything about Thynne, and little about Fielding. Curt suggests Anthony Gilbert is the likeliest candidate, though I think that if that were so, she would be likely to have discussed the book, and Haynes,in her memoir, and she didn't. It's also perhaps doubtful that they moved in the same social circles. One name that occurred to me is Jessie Rickard, who was a minor crime writer who became a somewhat peripheral member of the Detection Club, but I don't know enough to say whether there's any similarity between her writing and Haynes', or any other connection. Curt says, and I agree, that the completion is professionally accomplished. It's quite hard to see the join. The main problem with the story is that it's a tired effort, no doubt because of Haynes' poor health. I couldn't interest myself in the fate of the dastardly Robert Saunderson; the detective puzzle is very much secondary in appeal to the authorship mystery. But Inspector Stoddart is quite an appealing cop,and I look forward to reading some of his earlier cases. Dean Street Press have also reprinted Haynes' non-series mysteries,and I hope to review The Bungalow Mystery in due course..
Ann Cleeves has been a guest of honour at a literary festival in Dubai (sponsored by Emirates Airways, who no doubt find it a less stressful form of marketing than backing Arsenal!) and I was delighted to see that she's been talking about the implications of the renaissance in Golden Age fiction and the mega-success of the British Library Crime Classics in particular. The Sunday Telegraph picked up on her comments in a very intriguing article. We can debate endlessly whether the renewed popularity of Golden Age mysteries strikes a blow for feminism. Obviously it can be said that many of the social attitudes evinced in the books are wholly out of date, and as inappropriate today as some of our attitudes would have been back then. And it's certainly true that not all Golden Age books are masterpieces. Ann is, as she says, by no means a total fan of them, although she has also pointed out that there are GA influences in some of her books, not least The Glass Room, a very good Vera Stanhope novel. What is, to me, most striking,is the fact that the renewed interest in Golden Age fiction is giving rise to debate, not just in the UK and US but further afield. It's reasonable for views about the merits of the books to diverge. One (very generous) review of The Golden Age of Murder which said I'd never read a GA book I didn't like was, to be honest, well wide of the mark in that respect. It never bothers me if people tell me they don't like Christie or Sayers, or both of them, even though I'm a big fan. I do, though, wince when critics who have never, or rarely, read the books dismiss them and their authors out of hand. Trap for Cinderella, Iain Softley's recent adaptation of a novel written by Sebastien Japrisot sixty years earlier is one of the best psychological thrillers I've seen in years. On release, it met with indifferent reviews (often from film critics who simply don't care for plot twists, it would seem), but if you like classy, convoluted plotting in a movie, and you're willing to suspend disbelief somewhat - a requirement not confined to mysteries, of course - then give this one a go. It's gripping, and very elegantly done. This is a complex story centring upon the intimate friendship between Mickey and Do. They were childhood friends, but a crisis separated them for years. When they meet again, they become very close, but it soon becomes apparent that Do's devotion to Mickey has its unhealthy side. What happened in the past, and can Mickey trust those who claim to have her best interests at heart. E.R. Punshon was a strangely variable author. I find his very inconsistency rather intriguing, and that's partly why I've featured him several times in this blog, as well as in The Golden Age of Murder. He could, and often did, write well, although he was also apt to be wordy, and pace wasn't his strongest point. His books display a sharp sense of humour as well as providing quite a few worthwhile insights into different aspects of British society of the time. He could plot with a degree of ingenuity, and - on occasion - his characterisation could be incisive. Dorothy L. Sayers was a fan, and she was not easily pleased. Today's Forgotten Book, Mystery of Mr Jessop, first published in 1937 and now reissued in Dean Street Press's welcome series of classic reprints, was enjoyed by P.G. Wodehouse, who was a keen reader of detective stories and friendly with Christie and Anthony Berkeley, Given all Punshon's virtues, then, it's not surprising that he was elected to the Detection Club, of which he proved to be an affable and popular member. 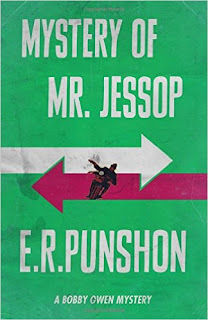 Mystery of Mr Jessop begins well, but slows after the first hundred pages. A partner in a jewellery firm has been murdered, a diamond necklace has gone missing, and a duke and duchess and the dodgy Cut and Come Again Club are mixed up in it all. At one point, Sergeant Bobby Owen makes a list of questions and observations about the case. There are more than forty questions, which illustrates Punshon's fondness for complication, and, perhaps, over-complication..
Dean Street Press are republishing a great many of the Bobby Owen books - some of which have long been scarce - and this initiative gives readers the opportunity to see just what an interesting writer he was. I would not, myself, rate this one too highly, but Bobby is on good form in books such as Information Received, Death of a Beauty Queen, and Diabolic Candelabra . And there's another title, recently published by Dean Street Press, which has some fascinating features and which I'll be covering here before long. Stanley Kubrick's The Shining was released in 1980, but I've managed to miss seeing it all these years - though I was keen to repair the omission. Kubrick was a gifted film-maker, and this movie, based on a novel by Stephen King which I haven't read, has enjoyed a great improvement in its reputation after receiving rather mixed reviews on its first release. It's now widely regarded as one of the great horror movies. Essentially, its storyline'offers a variant on the "haunted house" theme. Jack Torrance (played by Jack Nicholson) is hired to spend the winter looking after the remote Overlook Hotel. He's warned at the outset that the hotel has an unfortunate history - a previous caretaker, called Grady, went crazy and dismembered his family. But Jack isn't daunted. He's a writer,wanting to work in peace on his next project, and is accompanied by his wife (Shelley Duvall) and young son Danny. I was amused to see Philip Stone playing the part of Grady; I remember seeing him, when I was a small boy, in a crime series called The Rat Catchers, starring the once-popular Gerald Flood, that my parents used to watch, though I can't remember much about it. He was a quintessentially English actor, so it was rather odd to see him in this film. Jack Nicholson, needless to say, was entirely convincing as the increasingly deranged Torrance. The film is stronger on visual effects (the spookiness of the vast hotel is cleverly done, and there's a terrific climactic sequence in a snow-covered maze) than on narrative consistency. I gather King has mixed feelings about the adaptation, but on the whole, it's a gripping film, even if there's plenty of scope to debate whether the demons plaguing Jack Torrance come from within him or from outside. I'm glad I caught up with it at long last. I've just returned from the Essex Book Festival. A long way to go - I set off from snowy Lymm on Friday morning and finished up admiring a rather magical sunset over the water at Southend-on-Sea. But it was a good trip, and I was glad to play a small part in a huge county-wide event that is a credit to those in charge: Seona Ford, Camilla Shestopal, Ros Green, and their various colleagues. I had the great pleasure of meeting John Simenon, son of the legendary Georges, at a dinner on Friday evening. John has co-produced the imminent new version of Maigret, and was full of admiration for the performance of Rowan Atkinson. Definitely one to look out for. The following morning, I made the short journey to Westcliff to admire the truly fantastic book collection of John Cooper, who co-wrote two of my favourite books about the genre with Barry Pike. One or two items - inscribed books by Georgette Heyer and Henry Wade - stand out in my memory; the former is among the most interesting Golden Age items I've ever seen. Then it was back to Southend, in time for lunch and then a session moderated by journalist Jake Kerridge in which John Simenon and I enjoyed talking about Golden Age fiction from our different perspectives. An hour and a half sped by. After that, I moderated a panel about international crime fiction. Prior to the Festival, I'd worried about whether I'd be able to do a satisfactory job, given that,the focus of the panellists' books are very different from mine. 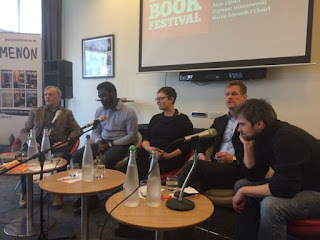 But one of the great things about crime fiction, I believe, is that the connections between crime novelists, however diverse their writing, are highly positive,and so it proved. So special thanks to the four people who made up a really excellent panel - see Lucy Dauman's phot above - from which I learned a lot. Leye Adenie is a first time novelist from Nigeria, the grandson of a Nigerian king and - I discovered over a glass or two of his favourite red wine that evening - also an IT expert and creator of patented inventions. We had a fascinating discussion. Robert Karjel is Swedish, and was until recently a Lieutenant Colonel in the Swedish air force. He's written four novels over the past fifteen years or so, and the success of My Name Is N, a thriller with a memorable protagonist, Ernst Grip, has enabled him to concentrate on writing full-time. Robert and I had a chip supper together on the seafront late on Saturday evening in weather conditions that can best be described as "bracing". Zgymunt Miloszeweski is a Polish writer whose books about another interesting central character, called Szacki, have made a big hit. And last but certainly not least was Anya Lipska, a Brit married to Pole whose books about an East End Polish fixer who teams up with a female cop have already won a substantial and enthusiastic following. 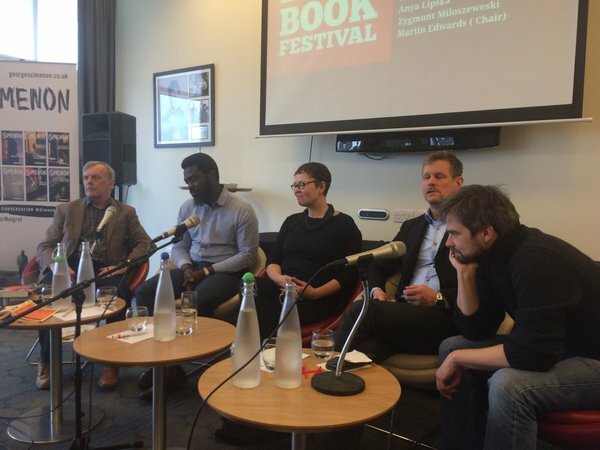 It was a real pleasure to get to know this quartet of writers, and to be part of a terrific Festival. Deadline, first published in 1971, introduced journalist Jim Larkin, who proceeded to appear in four more of Martin Russell's novels. 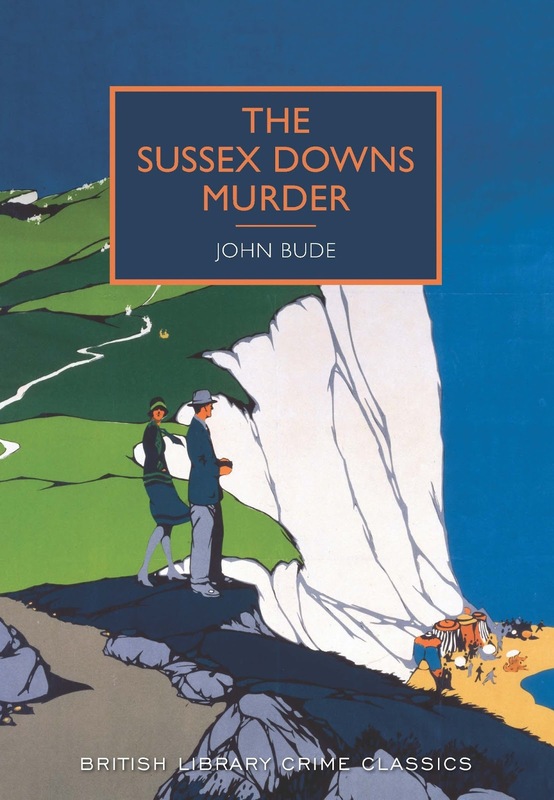 Russell had long experience of journalism and makes good use of it in this novel, the most memorable element of which is the vividly conveyed background of a newspaper in an out-of-season seaside resort. .
Larkin's arrival in town coincides with the killing of a young woman, whose body has been decapitated. A second death swiftly follows, and this time the corpse is mutilated even more extensively. Evidently a psychopathic serial killer is on the loose, and Larkin and his colleagues find themselves working flat out as they try to keep up with what reporters nowadays love to describe as "a fast-moving story". In my twenties, I went through a phase of reading Martin Russell novels, focusing on the stand-alones rather than those featuring Larkin. I was impressed by the twisty plots, which for me compensated for a dearth of characterisation. Russell was a writer who was wise enough to know his limitations, and for twenty years, from 1965 to 1984, he turned out pacy and entertaining mysteries. My interest in Russell stood me in good stead when Reg Hill, who had written about Russell for the first two editions of Twentieth Century Crime and Mystery Writers, was too busy to update his essay. I was asked to take over, and give Russell's work a fresh look. My views were much the same as Reg's. The plot of Deadline is much less ingenious than those of his best books, or indeed that of Francis Beeding's Death Walks in Eastrepps, another story about multiple murder in a seaside resort. but it's a light, easy read. Russell was,in the late seventies and early eighties, a prominent figure in the CWA and he also became a member of the Detection Club, but has not had any direct involvement with either organisation for many years. I don't know why he gave up writing so abruptly, but it may be that he felt that his type of crime fiction had become deeply unfashionable, and lost heart. If my guess is correct, I find that rather sad. He may not have been Ruth Rendell, but who was? His books are, as Reg said, both unpretentious and enjoyable. Cameron Crowe's 2001 film Vanilla Sky boasts an impressive cast, led by Tom Cruise, Penelope Cruz and Cameron Diaz. For good measure, Timothy Spall is cast as a British lawyer; I've recently watched Spall making a superb job of the title role in Mike Leigh's interesting, if possibly over-long film about my favourite artist, Turner: he really is a fine actor. This film is hard to classify: some describe it as a psychological thriller, but it also veers into sci-fi territory as the plot thickens. It certainly has a touch of originality about it, and that's always welcome. Cruise plays David Aames, a fabulously wealthy young publisher, who has inherited control of a vast business empire, but is menaced by a group of seven grumpy old board members. Cruise is involved with Diaz, who is much more serious about their relationship than he is, and soon he takes a shine to his best friend's new girl (Cruz). Intercut with these sequences are later scenes which reveal that Cruise has been disfigured in an accident, and stands accused of murder. What on earth happened to turn his world upside down? I found this premise intriguing, but although there were quite a few plot twists, (and several rather creepy moments) I became rather frustrated by the sluggish narrative pace. If Turner was arguably over-long, then I don''t think there's much doubt in this case - Vanilla Sky, it seems to me, would be much more gripping if cut by at least half an hour. Probably three-quarters of an hour. There's a portentousness about the script, it seems to me, which isn't entirely justified, much though I admire ambitious writing. Overall, I felt that the "psychology" was not as sophisticated as the film-makers seemed to believe; nor was the story as consistently thrilling as I'd hoped. But that can happen when you dare to do something different. Perhaps the excellence of the cast gave me unreasonably high expectations. Despite my reservations, Vanilla Sky is well-made, and well worth watching, not least for a very good soundtrack featuring Nancy Wilson, Paul McCartney,the Beach Boys et al.